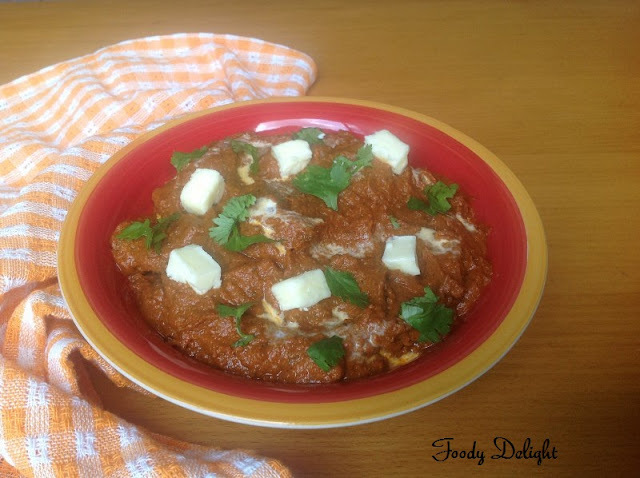 Chicken Makhani is one of my favorite non veg dish. It is rich, buttery creamy flavored dish that complements the chicken well. It can be made as mild or spicy as you wish by adjusting the spices. 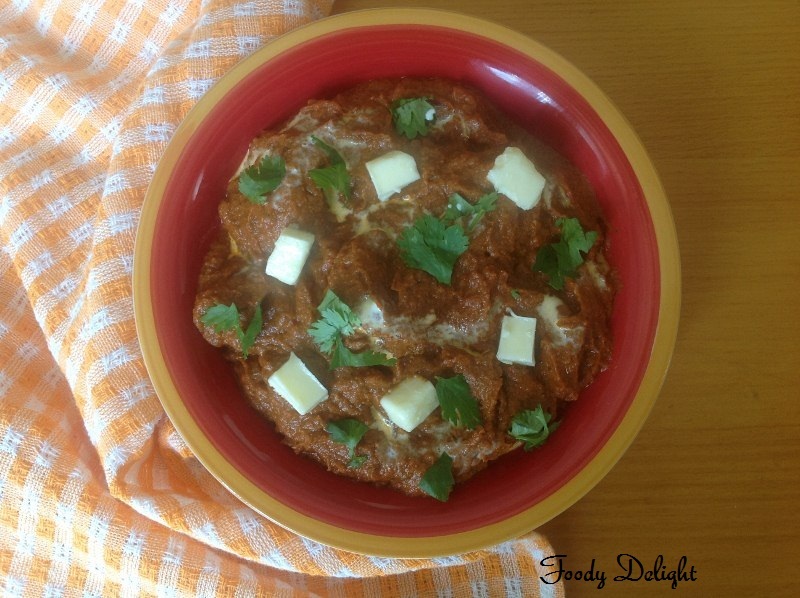 This gravy is best served with garlic naan or flavoured rice. Combine all the ingredients mentioned for the marination of the chicken in one bowl. Add the chicken pieces into it and coat all the pieces with the masala. Refrigerate the chicken pieces and marinate it for atleast 1 hour. For the best result marinate the chicken pieces for 24 hours. Preheat the oven at 400 deg F.
Place the marinated chicken pieces in the baking sheets,slightly spray the cubes with cooking spray or you can brush the cubes with the oil. Bake the cubes for about 25 minutes or till done. Soak the cashewnuts in hot water for 30 minutes. Then grind the cashewnuts into smooth paste by adding required amount of water.Keep it aside. Place the pan on medium flame and add 2 tbsp of butter into it. When butter melts, add shahi jeera or cumin seeds,cloves, cinnamom stick, javitri,bay leaves and green cardamom. Fry till you get nice aroma from the spices. Then add onion paste and fry till paste slightly changes its original colour.Stir in the ginger paste,garlic paste and green chilly paste. Fry till raw smell goes off from all the paste. Now add red chilly powder,cumin powder and coriander powder to the onion paste.Fry for a minute. Add tomato puree and mix well.Cover and cook till the gravy leaves the sides of the pan. In between keep an eye and stir the gravy,because gravy might stick to the bottom. Take care while stirring the gravy drops may splash on you. When you see oil separating out of the gravy, add about 1 cup of water. You can add water as per your choice. At this point let the gravy be thin because the gravy will become thick after you add cashew nut paste. Add garam masala and adjust the salt.Cook for 5 to 6 minutes.If you find the gravy is still thick, add more water and adjust the gravy. Add cashew nut paste and remaining butter. Cover and cook till the raw smell goes from the paste and also the gravy becomes thick. Stir frequently because the gravy may stick to the bottom and will burn quickly. Then add crush kasuri methi and stir well. Finally add heavy cream and baked chicken pieces and simmer the gravy for about 5 minutes. Turn off the flame and garnish with the chopped cilantro. 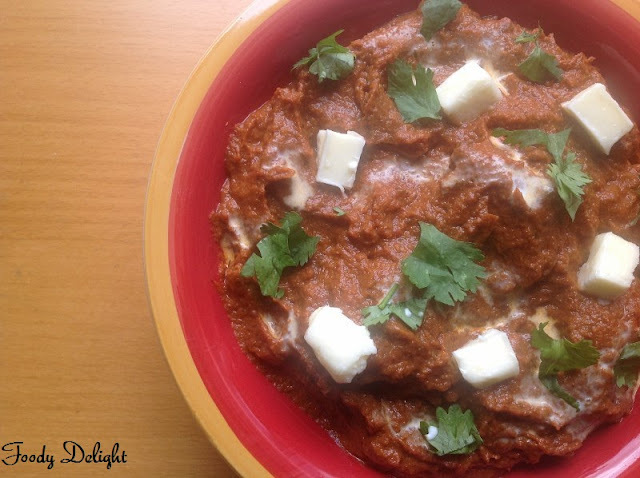 Butter chicken is ready to serve with naan, garlic naan, parathas or flavoured rice. 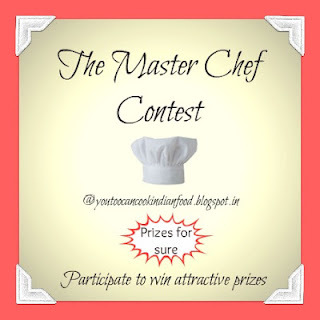 The Master Chef Contest @" You Too Can Cook - Indian Food Recipes""
Its my fav dish Pranjali :) yours looks so tempting, oh wish could have it right now!! 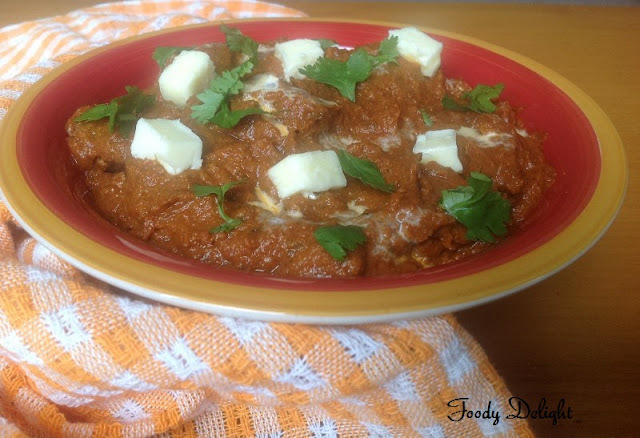 My all time favorite :) Looks so delicious... My best wishes..Thanks for linking such a yummy recipe to the contest..
cant take off my eyes from the screen.. looks very tempting and incredible..
Irresistible,droolworthy and totally inviting butter chicken. Butter chicken is one of my favourite! I'm not a big fan of spicy food so thanks so much for this!